So I was sitting at home watching Everyday Italian, and Giada made this dish. I couldn't help but give it a try. If you are craving a rich Italian dish, you should too. :] I tweaked it just a little bit, and I was happy with the results. Bring a large pot of salted water to a boil over high heat. Add the pasta and cook until tender but still firm to the bite, stirring occasionally, about 8 minutes. Drain pasta. Warm the olive oil in a large skillet over medium heat. Add the pancetta and cook until lightly golden, about 5 minutes. While that is cooking, empty can of tomatoes into a food processor and pulse until it become a slightly chunky sauce. Then pour into a large baking dish and set aside. 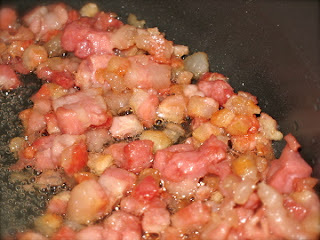 Remove the pancetta from the pan when it's golden brown with a slotted spoon and transfer to a large bowl. 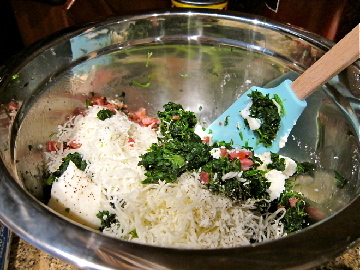 Add the spinach, ricotta cheese, Italian cheese, and pepper. Stir to combine. Stuff the shells with about 2 tablespoons of the spinach mixture in each and place the stuffed shells in the baking dish on top of the tomato sauce. Melt the butter in a medium saucepan. Add the garlic and cook for 1 minute. Add the cream and bring to a simmer. Turn the heat to very low and add the 2 cups Italian cheese, parsley, and pepper. Stir until the cheese is dissolved. Pour the sauce over the shells. Top with the remaining 1/4 cup Italian cheese. Bake until golden on top, about 25 minutes. The end result? Mouth-watering goodness. YUM! Turned out great. The tomato sauce I added to the recipe balanced out the richness of the cheese. If I make it again, I may add some sausage or shredded chicken. My hubby is a meat lover, for sure. Saleena, I love your blog! Thank you so much! I am having so much fun being a wife, I know you will too :] And thank you for becoming a follower...I was beginning to think no one was reading! Sorry I'm a little late. That's awesome. I can hardly wait! 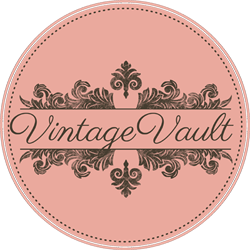 Well, I only have 13 followers--but I will feature you in my next post! Your blog is too good to not be read by more people. Take care, dear! xoxo.